I wonder if they saw it? Ever since its introduction, I've been unsatisfied with the new route for the Ronde van Vlaanderen. The Oude Kwaremont-Paterberg combo just makes the course too backended, with almost everybody waiting for the last ascent to make their move. Therefore, I've decided to map a new, better final. It starts with a kasseizone with ~100 km to go: 14.5 km of cobbles, mostly flat, but including the Molenberg and Wolvenberg. The heuvelzone starts at the Oude Kwaremont (~50 km to go): 10 hills of varying difficulty, 6 of them cobbled, with the Mariaborrestraat and the Haaghoek (my favourite kasseistrook) thrown in for good measure. The start of the heuvelzone is very much like the parcours used this year - but after the Taaienberg we turn north towards ten Stene, Haaghoek and Leberg. The run-in to Oudenaarde features the Boigneberg and Eikenberg as last jumpboards for an attack, with the Eikenberg topping at just 6.1 km from the line. The final kilometres will go straight through the centre of Oudenaarde, with the many turns favouring solo riders or small groups over bigger groups. The finish line is at the same spot as now, only approached from the other direction. While I agree that your final is better balanced, and better for TV because it reuses less places, only a short stretch really. The real issue with classics is that they reuse the same route, they need to chance every year. Not saying it would be a totally different race, just saying take all the climbs put them in a bag and shuffle the order of which they come. The problem is same route makes the winning tactic very obvious, if it is a new route each team would have to scout and likely find different places to attack than the others. As is now it is basically hit it that last time around, just before BMC start to pull when it is too late as always. To be fair to the Ronde, something needs to be done about LBL a lot before this race. Last years LBL was perhaps the most boring race I have ever watched, and it was 100% on the people that made the course, only Pozzovivo tried something, and that failed. The real issue with classics is that they reuse the same route, they need to chance every year. Oh, I have plenty of other options up my sleeve, all using different routes. It just takes some time to map them all. A super short "Mountain" prologue up Himmelbjerget at above 11%, on top of this only the first part of the days climb is paved, the rest is on relatively narrow dirt paths, no car support this stage, but considering the length of the stage, it isn't really needed, just a couple of guys with wheels on the climb. While MTT's are normally just a wattage exercise this is more of a uphill sprinting exercise. And a stage where being in shape, and warming up well can prove decisive. Worth noting is that it will take a bit of fixing to make this stage possible, but it shouldn't be too expensive. And really compared to the visuals it will provide, it is worth it. The Traditional Vejle stage starts out in Herning the birth town of Bjarne Riis, The early part of the stage is quite flat, but features a bit of gravel roads though, with sections of the historical Hærvejen also ridden, the parcours however change as soon as the route hits Jelling shortly outside of Vejle from where several climbs make up a tough finale to the stage. Tackling climbs like Sleldevej and Højen Skov to reduce the size of the peloton before the hardest climb of the day Høgsholt comes with 22km's remaining. From here the route enters the valley of Grejsdalen where climbs of Gl. Hornstrupvej and Bøgeagervej, on opposide sides of the valley, comes in short succession. The valley takes the peloton into Vejle where the steep Gl. Kongevej awaits, however the climb is cut short as the route enters Uhrskovvej, which leads into a descent with a few switch backs, and a few hundred meters to sprint for the win in a downhill sprint on Jellingvej. Good climbers with good descending and a bit of a pop should be able to fare well on this stage. Stage number five sees hilly races brought to Zealand, the west coast. With about 1600 meters of elevation on the day, the stage is quite tricky. Starting out in Næstved and running north through some of the most spectacular nature Zealand has to offer outside of Norhern Zealand the route passes through historically significant places such as Sorø as well. Later after passing through Kalundborg, several of the great hills of Odsherred are used as spring boards for attacks from afar. The quadruple threat of Kårupvej Ordrupvej, Svellebakken and Asnæs Indelukke are sure to cause splits. However any riders getting away will have to stay clear for 20 almost flat kilometers before seing the hills of Lumsås. Lumsås is located on the top of a hill between two fjords, and the final consists of a 5.1km loop from one fjord through Lumsås and down to the other and vica versa. The loop has two climbs and the finish is the third time the line is crossed. How will the race caravan get from Aabenraa to Næstved? It's a pretty long transfer whichever way you go, via Germany, Fehmarn & Lolland-Falster or via the Great Belt. Unless the use the Fynshav-Bøjden ferry of course ... but wouldn't it then be better to have the stage finish in Sønderborg? via Great belt (E45 to Kolding, E20 to Slagelse and Main 22 to Næstved), it is about a 2:30 transfer so pretty long, yet not unheard of. Fynshav Boyden only has very limited space for buses and trucks so not an option. Also stage need to finish in Aabenraa as this is where the gravel roads are in abundance and there is a rather long cobbled climb. Best way to shorten the transfer down would imo. be moving the next days stage start to Korsør or something shaving off 40 minutes or so. I think it can be done as is though. via Great belt (E45 to Kolding, E20 to Slagelse and Main 22 to Næstved), it is about a 2:30 transfer so pretty long, yet not unheard of. That's a LONG transfer for Denmark. weren't happy with the Vejle-Nyborg transfer this year; although with Fuglsang in the condition he was in, any transfer would have been uncomfortable and 'too long' for him - and are rarely happy with anything. Gravel roads and cobbled climb! I like the sound of that! In this edition stages 2-4 are where the gaps should present themselves, apart from on the TT's. That stage 3 is a beast, start of by the west coast for wind, of cause this would not be enough, so I decided to have them ride on gravel roads for a lot of the stage. Some of the gravel are even along the west coast at the start of the stage, like the one below, a maintenance road for the flood dikes. DB-Coop for PDR race director! are rarely happy with anything. Well they don't have to come... Birdsong to be co-opted onto a special team consisting of outcast Danish riders..
Really I didn't plan to have that from the beginning, but in the end I ended up having a short stage to Copenhagen allowing for a second ITT, which I would argue is probably needed. As far as late ITT it is almost always going to be like that given that Apart from western Zealand that island is so flat that any stages where time can be won will almost have to be in Jutland, hence why Zealand or Funen normally host the ITT on stage 4B. Stage 5 not being hard enough to change anything, finishing on Frederiksberg Allé means that from a race perspective it is the same. It is some what bad for TV I guess, with the least appealing stage last, or well the stage people might not watch, if people do that people miss the podium. However what is good about this configuration is what it does to the possibilities of stage 5A. The last stage 5B (ITT) is ending on Frederiksberg Allé as normal. However stage 5A does not end here, instead it tackles a circuit consisting of both Valby bakke (From the less steep side) and the cobbles up the "climb" at Ny Carlsbervej. Providing a stage finish where gaps may happen, with finish being a top Valby Bakke next to Frederiksberg Castle. Another reason why I am suggesting the 5 man squads, it will be easier for Danish riders to be given an opportunity for themselves in - Say Fuglsangs asks to ride PDR, well now Astana have to find 7 other riders, in this way it would be well Fuglsang wants to ride, why not give him Gruzdev and de Vresse along with two neo pros to see what they can do. I think it makes it easier to get teams to go. I fully agree. Did in fact only bring 6 riders last year, and were down to 5 after Fuglsang crashed out. That may well have cost Lutsenko the overall win as the young Kazakh was flying in the final stage. 5 riders is quite extreme - but I think that non-WT races should as a standard be limited to 6 riders. Exceptions could be made if well-argued for. They could even allow the "local" teams bigger teams of 8 to give more Conti riders a chance to ride, and compensate for the difference in abilities. It's done in San Luis. One of the great thing this year, and many years in PDR is that the racing is far more opportunistic than at say the Tour. What this comes down to is imo. that opportunistic riding is more likely to work. Now what makes opportunistic riding possible. Well the larger the gap between the skill of the stars and the doms of a race, the more likely opportunistic riding is to be successful. PDR being a good example. Note that this effect can also be achieved somewhat by reducing the amount of doms available to each captain. Basically I think you want teams and doms, to discourage riders unable to win to ride for someone else not on their team. Also you'd want some sort of stability. But again back to my point above about larger skill gap this is the reason why people argue womens cycling are a better watch as this is the case resulting in more opportunistic riding. As far as the conti teams goes, I think you'd simply see more teams, if you as a Race Director makes it clear that, as long as their is not 11 or something, you are going to invite all the danish conti teams, take last year, 3 teams are great and one knowing they might not make the number 1 goal of the season sort of stays away from too hard spending. If you made it clear you was handing out invites, then sponsors like Jutlander Bank would be likely to step into the conti scene I believe. Secondly you would spread the talents wider, no-one wants to be the 7th best guy on the best danish conti team as this would mean missing PDR, if you could be a top 2 guy on another team, likewise a rider now just seen as a 3rd man, a dom (And how good doms does conti teams need for these races?) might be a leader elsewhere. Also you get more teams that want the break, ie. more hectic start to stages, and if you have 8 danish conti teams, guess what you might see 6 or 7 riders in breaks many days, and guess what also, it will be harder to control this break as the GT teams only have 5 riders each. Five is what I see as a break-off point at five you can still defend a lead if need be, you can pull for the sprint, or you can do both if you have a great squad. Also I love the extremity of only having five riders as it makes your doms skill more important as well, your doms being good riders or pack filler will actually matter. Stage 1 - Somewhere in the North likely starting in Skagen and finishing in either Hanstholm or Thisted, likely long going about the 220 mark and likely very dependent on wind, probably not the hardest of finals so likely a sprint though those not up for a long windy race could be out of GC, if not the race altogether. Stage 2 - Nykøbing (Mors) to Hammel 209 km I have this one drawn up already the stage will see many astonishing sights, Hjerl Hede, Dollerup Bakker, Tange Sø and Haurumdalen. The stage is quite flat to start off with but gets harder after Ulstrup. And the final is dominated by the hard climbs of Haurumdalen including a climb of the Pøt Mølle climb just two kilometers before the finishing line in front of the Frisenborg Catstle. This stage will likely see some gaps being created in the GC. The last 30 km has 400 meters of elevation! Stage 4a - Funen stage likely using climbs of south funen and probably ending in Nyborg for practical reasons. Maybe starting in Faaborg, will try to shove in climbs in the first eighty to compensate for a flat finish in the last 20. Likely featuring castles and the largest rock in Denmark - Damestenen. Stage 4b - ITT Korsør - Skælskør 18 km - Already have this one drawn up and it is a beauty, the 18 km ITT have part asphalt, part white gravel and part forest roads. There is a single climb, a short but steep climb partly on forest roads. Should be the deciding force in the race most likely. Stage 5 - Slagelse - Frederiksberg, probably a rather easy stage, should be a sprint. Finish approach will be Valbybakke from the less steep side, but all the way from the base, and from there the shortest way to Frederiksberg Alle, should be a sprint, but there is a chance of an attack, also not all sprinters will like this sort of finish at all. The road cycling season is (almost) over, and to get us through the dark and cold months, we turn to race-building. Tonight, I'm resurrecting a race that had a short, but memorable history: The San Francisco GP! For a HC or WT one-day race, they could do 15 laps for a 214.5 km race with 2460 altitude metres. A World Championship would have 18 laps or 257.4 km and 2952 altitude metres. All we need now is a committed sponsor and some locals to do the organisation, and we're good to go. Afterwards, they can do a number of laps of the city circuit: 7 for a WT one-day race (206.8 km), 11 for a World Championship (264 km). This would push the total altitude metres to between 3100 and 3800. Continuing my loose series of one-day race suggestions is a circuit in Bristol. Inspired by this year's Tour of Britain stage, I thought "how can we make this harder?" For a one-day race "Bristol GP", 10 laps (2450 altitude metres) will do, for a 174 km race. If Bristol were to be awarded the World Championships, I'd let the men's elite do 17 laps for a total of 261 km and 3675 altitude metres. And while I was at it, I also mapped out a possible Worlds circuit in Jerusalem. The start/finish area is at Yad Vashem. 12 laps will give a total length of 271.2 km and 5676 altitude metres. Did anybody say "climbers' Worlds"? Over the years, DB-Coop has filled this thread with varied stages for the Tour of Denmark. Just after Christmas, I started bouncing the idea of a 3-week Scandinavian Grand Tour around on Twitter - and it was very well-received. Things went from there, and now I have a full first edition of such a race, to be held in June. And yes, there will be stages under the midnight sun (or close enough)! I know that having a fourth GT is rather illusional, but this is just meant to be a bit of fun ... and show some new ideas and concepts that we might see in a real race one day. Rules for GC are the usual ones; bonus seconds are handed out at bonus sprints (-3", -2", -1") and all stage finishes except TTs (-10", -6", -4"). Points for the points classification will be awarded at every stage finish (except a possible TTT) and at 3 bonus sprints on every stage. The exact breakdown follows further down. 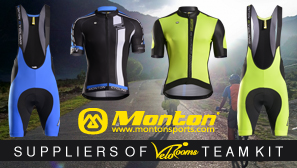 The mountain jersey is, almost logically, sponsored by a company: Uno-X are the main sponsor of the Tour of Norway and Norwegian Conti Uno-X Hydrogen Development Team. Their self-service petrol stations are spread across Norway and Denmark. There will be mountain sprints on most stages, with the categorisation ranging from HC (30 points) to Cat. 4 (3 points) - you can see the exact breakdown lower in this post. The first riders at every bonus sprint, mountain sprint, stage finish and a number of additional so-called 'activity sprints' will receive 'activity points' (3, 2, 1 points for the top-3), and the rider with the most 'activity points' gets to wear this jersey that unites the colours of all three home countries of the ScandiGT. Since lots of things have to be put together, the first edition of the ScandiGT isn't planned until 2020 - which gives us the opportunity to use that first edition as a commemoration. I'll present the 2020 ScandiGT over the next days and weeks. In 1920, following World War 1, plebiscites were held in the northern parts of what was then the Prussian province of Schleswig-Holstein (itself only Prussian since 1864, after Denmark lost the so-called Second Schleswig War). The majority in zone 1 voted for Denmark, and the area was thus transferred back to Denmark after 56 years of German rule. Nevertheless, this left minorities on both sides of the border: A German minority in Denmark as well as a Danish minority in Germany. After World War 2, the Danish and German governments signed the Bonn-Copenhagen declarations in 1955, guaranteeing the existence and equal treatment of minorities. Over the more than 60 years that have passed since, the area has become a model for the peaceful coexistence of cultural minorities across the world. It's no secret that yours truly grew up as part of that Danish minority, so having a cycling race honour the region I call home has long been a dream of mine. By starting the ScandiGT in Schleswig-Holstein 100 years after the plebiscites, visiting many places connected to the history of the area, especially the First and Second Schleswig Wars, the plebiscite & reunification of Sønderjylland, and the Danish minority in Germany, we'll commemorate the sometimes violent past, the peaceful and cooperative present and the (hopefully) bright future of the Danish-German border region. First mentioned in 1161 as a stronghold of the Schleswig bishops, it became Danish in 1460, and in 1544 became the residence of the dukes of Schleswig-Holstein-Gottorf (a cadet branch of the Danish royal house) until they lost their Schleswig possessions in 1713, during the Great Northern War. The Gottorf dukes renovated and re-built the castle several times; the current look is the result of the last big building project around 1700 when the baroque southern wing was built. Demoted to being only the residence of the Danish governors of Schleswig in the 18th and 19th centuries, the castle was turned into a barracks during the First Schleswig War and continued as such until after World War 2. 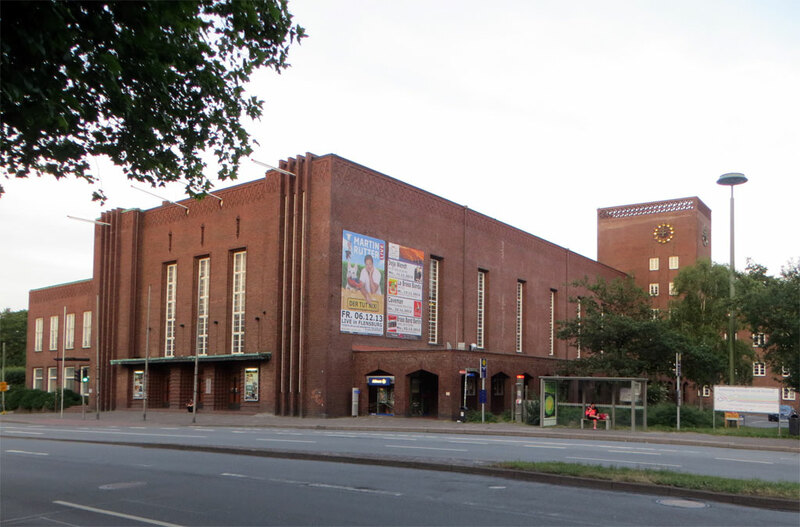 Today it houses the Schleswig-Holsteinische Landesmuseen, the state's main museum for art (from the Middle Ages to the 20th century) and archaeology (incl. two bog bodies and the Nydam boat, a sea-going rowing ship from the 4th century that was a precursor to the famous Viking ships). EDIT: As a special event, there will be a sprint challenge in conjunction with the team presentation; see a few posts further down for the details. 1. For places in what is today Germany, I will name the German toponym first, followed by the Danish one, on the first occasion the place is mentioned. Afterwards, I will use only the German name. The 10.9 km course includes 1400 m of gravel road plus 250 m of cobbles. The first 4 km aren't particularly challenging; but after 2.4 km the following vehicles will be diverted since the gravel road inside the Haithabu ramparts is too narrow to be used by cars. So teams will have to place staff with wheels & spare bikes along a 2.5 km stretch to take care of possible mechanicals. There will be plenty of neutral support on motorbikes as well. After 4 km, the asphalt turns into gravel, soon after the riders pass through the southern entrance into Haithabu and ride through the former Viking trade port. After crossing the rampart at the northern gate, they're reunited with their team car, and the intermediate time is taken at the Wikinger Museum Haithabu after 5.4 km. Passing the Romanesque church of Haddeby (which may or may not be built on the site of the first Christian church in Scandinavia), it is now possible to gaze across the Schlei/Slien and see the city of Schleswig on the other bank, with the cathedral towering over the old city. The next four km are again relatively easy; first on the same road as at the start of the course, then along the banks of the Schlei towards the city centre. Having passed the Domschule (founded in 1307) just before the flamme rouge, the riders turn right at the end of the Königstraße towards the cathedral, then turn left onto the cobbled Süderdomstraße for the last 250 m before they finish on the Rathausmarkt. I had an idea to improve team presentations. Run it concurrently and in the vicinity of a sprint challenge. Same idea as the old Quebec version - team selects a rider and those riders face off in heats, a semi and a final. Have a couple of teams presented inbetween each heat and then show the sprint up on the big screen. The winner gets to wear the leader's jersey on stage 1. Obviously you wouldn't want it at every event, but one or two races through the year could make it their "thing" and have it as an extra attraction. Something we hadn't touched on before at all: The ScandiGT will be run with 8 riders per team, and will invite 24 teams. One rider of each team enters the Sprint Challenge. The first round will have 8 heats à 3 riders, then there's a quarterfinal round with 2 riders per heat, same for the semi-finals and final. 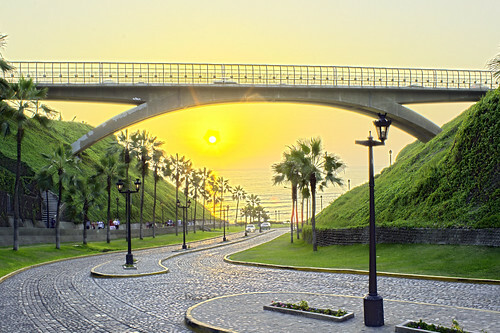 Whenever I'm in Lima I always think they could make use of this in a bike race, perhaps as part of a city circuit on the final day of a stage race. ~830m long, average gradient 6.3% with a max gradient of 19%, and as you can hopefully see it's cobbled too (although only from about a third of the way up). Today's sign-in is at the A.P. Møller Skolen, one of the two Gymnasien (high schools, sort of) of the Danish minority in Sydslesvig. Designed by a.o. Henning Larsen, Mads Møller, and Ólafur Elíasson, it was built to relieve the old Duborg-Skolen in Flensburg/Flensborg, paid for by the shipping company Mærsk's trust fund "A. P. Møller og Hustru Chastine Mc-Kinney Møllers Fond til almene Formaal" on the condition that the school would be named for the company's founder. Inaugurated in 2008, the school lies to the east of Schleswig's city centre, close to the Schlei. The school and surrounding area has ample space for team buses etc., and as it's a Sunday, the students don't have to skive off to attend the sign-in. A 6.3 neutral zone is much the same as the second half of the ITT, passing the cathedral and Schloss Gottorp before going towards Haddeby where the real start is given at the local church. After crossing the dam that (today) separates the Haddebyer Noor from the Schlei, the route takes the peloton around the Noor and the adjacent Selker Noor and then turns west towards Dannewerk/Dannevirke. 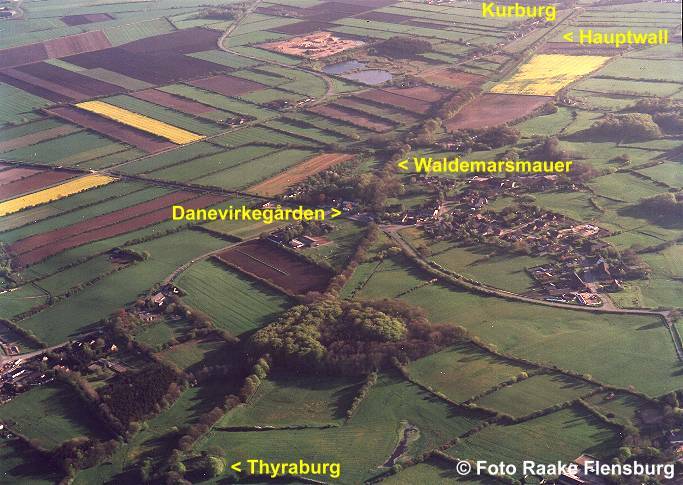 The small village lies on the millenia-old traffic route Ochsenweg/Oksevejen, also called Heerweg/Hærvejen (Oxes' Way or Armies' Way). To protect their southern border, Danish rulers built earthworks, ramparts and walls over centuries, starting (according to the last archaeological results) at some point in the 7th century (possibly even earlier) and continuing through to the 12th century when the Waldemarmauer/Valdemarsmuren (Waldemar's Wall), a stone wall backed by an earthen rampart. Danevirke simply means "the Danes' work" (in the old meaning of work = bulwark/fortification). Even in the 17th century and the 1864 war, the ramparts were fortified again, and the Danish defense failed in a large part due to the rivers and fjords to the west and east freezing over, enabling the Prussian and Austrian troops to bypass the fortifications and forcing the Danish forces to withdraw to the north in order to not be encircled. The first bonus sprint of the race is held where the modern road (still following the Hærvejen route) crosses the Danevirke after 12.3 km of racing, meaning that the sprinters' teams might keep things together to score points - or that rouleurs will try even harder to form an early break. Now we go north towards Schuby/Skovby, a commuter village close to Schleswig, where we cross the Autobahn 7 - the Hærvejen's modern equivalent, signified by big horns at the village's roundabouts - and turn east, heading into Angeln/Angel. Yes, the area that the people who emigrated to then-Britain came from, naming the country for themselves and making it England. The first mountain sprint (category 4) is held in Füsing/Fysing, a small village with some nicely-preserved old farmsteads. 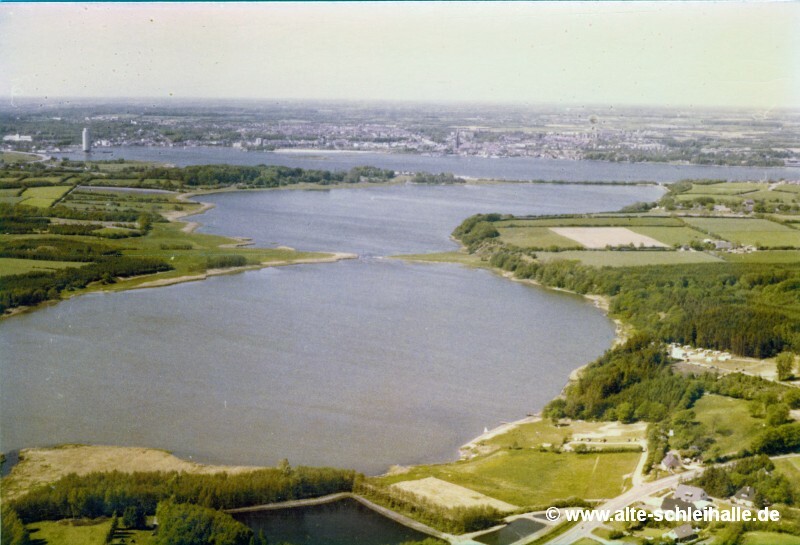 Between the modern village and the Schlei, there was a very early Viking settlement (technically still late Germanic Iron Age), the precursor of Haithabu. After 45 km we cross the Schlei at Lindaunis/Lindånæs on a narrow bridge that also carries the Flensburg-Kiel railway. The train tracks will be covered over for the passage of the race. We now travel some 20 km through Schwansen/Svans (I will not directly translate that) before reaching Kappeln/Kappel. After crossing back to the north side of the Schlei on the relatively new bridge (inaugurated in 2002 as the third bridge in this place), the riders now face a 2 km climb out of the town - but don't worry, the height difference is only 32 m.
The next 30 km through Angeln are rolling, passing through Süderbrarup/Sønder Brarup and Böklund/Bøglund (well-known, at least in Germany, for their sausages) and eventually reaching Idstedt/Isted. 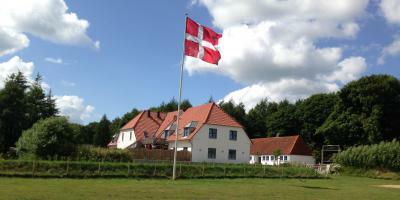 The second bonus sprint is held in the village to commemorate the bloody final battle of the First Schleswig War, 24-25 August 1850, that raged in the fields around the village. The Idstedt-Löwe/Istedløven, also called Flensburger Löwe/Flensborgløven (Isted Lion or Flensburg Lion) was commissioned as a monument to the battle of Idstedt, and erected in 1862 on the largest cemetery of Flensburg. Facing south, the placing of the monument provoked German nationalists, and when Prussia and Austria conquered Schleswig-Holstein only two years later, locals tried to destroy the statue, being stopped only by the new German authorities. Dismantled and put in storage for a couple of years, the lion was then moved to Berlin and erected there, as a monument to the Second Schleswig War and the victory over Denmark, in 1868. Moved within Berlin in 1878, it stayed there until 1945. After World War II, the Danish government petitioned Eisenhower for a return of the monument to Denmark, and it was put in a courtyard behind Tøjhusmuseet (the Danish Arsenal Museum) until 2000, when a redesign of the area led to it being moved to a more prominent location next to the Royal Library. Already at the unveiling, the Danish culture minister said that she wished for a return to the original spot in Flensburg, and in 2011 the Isted Lion finally came home. 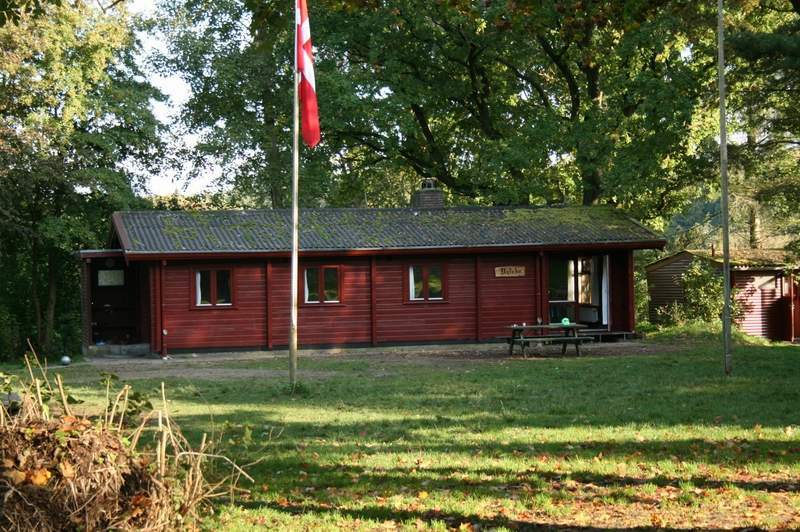 Not long after, an activity sprint is held at the gates of Spejdergården Tydal (Scouts' Farm Tydal), another institution of the Danish minority where scouts from Sydslesvig, Denmark and all over the world can convene to ... do scouting stuff, I guess. I was there for a one-week school trip in 4th (?) grade. Next is Oeversee where the day's third and final bonus sprint commemorates the battle of Sankelmark, a fight between advancing Austrian troops and retreating Danish troops in February 1864. The Danes succeeded in covering their retreat to Dybbøl ... but that's a story for another day. The battle also saw the very first field hospital under the Red Cross flag. Jarplund/Jaruplund, site of a Danish højskole (a sort of adult education centre), hosts the feed zone after 125 km, and this is also where we reach the Hærvejen again, using it to get to Harrislee/Harreslev, a town next to the Danish border that is probably best-known in Scandinavia for its "grænsekiosker" (border kiosks) - that are actually huge supermarkets with (relative to Denmark) cheap beer, candy and other stuff. But the town also has a vibrant Danish community and is a.o. the residence of Anke Spoorendonk, the first SSW minister in a German federal state's government. From Harrislee we enter Flensburg for the first time, more precisely the district of Duburg/Duborg, the location of the Danish king's medieval castle overlooking the city below. Later Duborg-Skolen was built on the castle's foundations, and yours truly went to school there for seven years. We'll get back to Flensburg later though, now we're only passing through, descending the Duburger Straße and rounding the Flensburger Förde/Flensborg Fjord on Schiffbrücke, Hafendamm and Ballastbrücke before climbing out of the city's "bowl" again. The third mountain sprint of the day is on the Fördestraße after 144.9 km, on the way to Glücksburg/Lyksborg, after passing through the quarter of Mürwik/Mørvig, home of the German naval academy. The castle of Glücksburg was the residence of the Schleswig-Holstein-Sonderburg-Glücksburg family, a cadet branch of the Oldenburg dynasty, until 1863 - when Christian X became king of Denmark. Due to his many descendants who married into other royal houses, he was also called "Europe's father-in-law"; his descendants still sit on the Danish throne, his son's second son became king of Norway, and he's also an ancestor of Prince Philip, the husband of British Queen Elizabeth II. An activity sprint is held in front of the castle, then the race returns to Flensburg via the Glücksburger Straße. The finishing circuit is entered on the Bismarckstraße, about 2 km from the finish. Through Süderhofenden, Norderhofenden and Schiffbrücke, we reach the bottom of Toosbüystraße, a 600 m climb from sea level at the Förde to 35 m; the finish is at the top of the climb and is passed for the first time after 167.6 km, also used as a mountain sprint. Turning onto Duburger Straße at the top of the climb, the next turn takes the peloton onto the cobbles of the Ritterstraße and Königstraße, passing Duborg-Skolen. 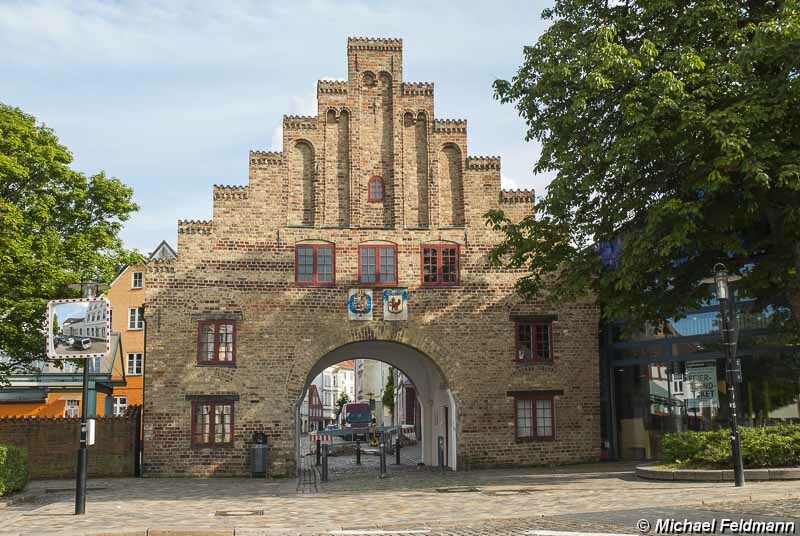 After the descent of Duburger Straße that they already did on the first passage of Flensburg, the riders will have to make a 180° degree around the Nordertor/Nørreport and enter the cobbled Norderstraße, passing the Phänomenta science museum, the Flensborghus (built in 1725 with bricks from the ruins of Duburg castle and today used by the Danish minority) and the Danish library for Sydslesvig. Here they turn left onto the very narrow Oluf-Samson-Gang, famous as Flensburg's answer to the Reeperbahn. Reaching asphalt on the Schiffbrücke, the riders now turn around the tip of the Förde and climb the (asphalted) Jürgensgaarder Straße on the other side, past the St. Jürgen/Sankt Jørgen church, the first riders being awarded with an activity sprint on each lap. Through the Bismarckstraße, passing the Deutsches Haus, the peloton reaches Süderhofenden from where it is just over 1 km to the bottom of the Toosbüystraße climb. If the peloton hasn't split on the previous six climbs in Duburg/Duborg and Jürgensby/Jørgensby, this uphill drag to the final will cause the first time gaps of the race. The podium ceremony will be held a few metres up the road in front of the Finanzamt, while team vehicles can park just around the corner in the Waldstraße, on the parking spaces of the Finanzamt, Agentur für Arbeit, and a supermarket. Teams will stay in hotels in Flensburg or nearby overnight, with stage 3 starting here the next day.